You are going to Watch Galaxy Angel AA Episode 49-50 English dubbed online free episodes with HQ / high quality. 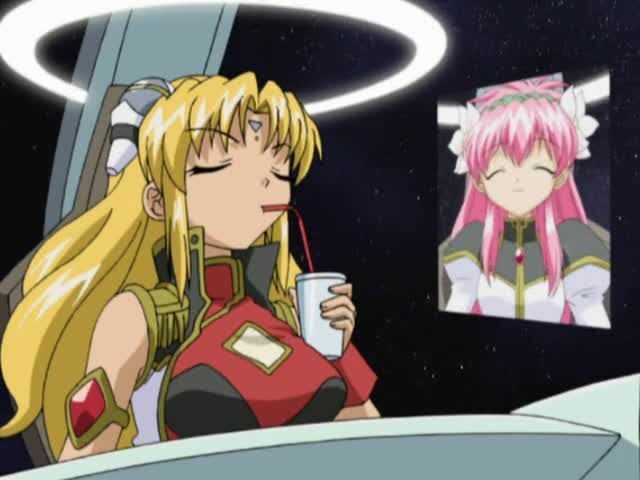 Stream Anime Galaxy Angel AA Episode 49-50 Online English dub Fresh Packed Fish ~ After Commander Volcott faints and is taken to hospital, he charges the Angels to be the fighters of justice before passing away. Thereafter, the Angels play out a cliché 52 episode super sentai TV program in fifteen minutes. Prohibited String-pulling String-pulling Fermented Beans ~ At the request of Mint, Ranpha and Milfeulle are sent to a planet in which customs and protocol are held above all else. The king of the planet has a dangly hair much like a pullstring and Milfeulle can not help but point it out. Despite death glares from the court royals, they are invited to dinner where their will to suppress the urge to pull the king’s hair is pushed to its limit. Ranpha and Milfeulle then sneaks into king’s bedroom and pull the string, causing the king to act differently and explode. Ranpha and Milfeulle turn into kings and Mint, the former victim, escapes. Kokomo and Maribu arrive next and begin to feel the urge to pull the king’s hair as they greet, repeating the cycle.